Moroccan Biscotti - Do You Know The Muffin Man? Notes: Because the cookies are so small, I think currants would be better (I only had jumbo Thompson raisins). 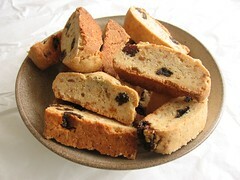 Use a very sharp, very thin knife, as the biscotti tend to crumble apart. The orange flower water is not subtle.